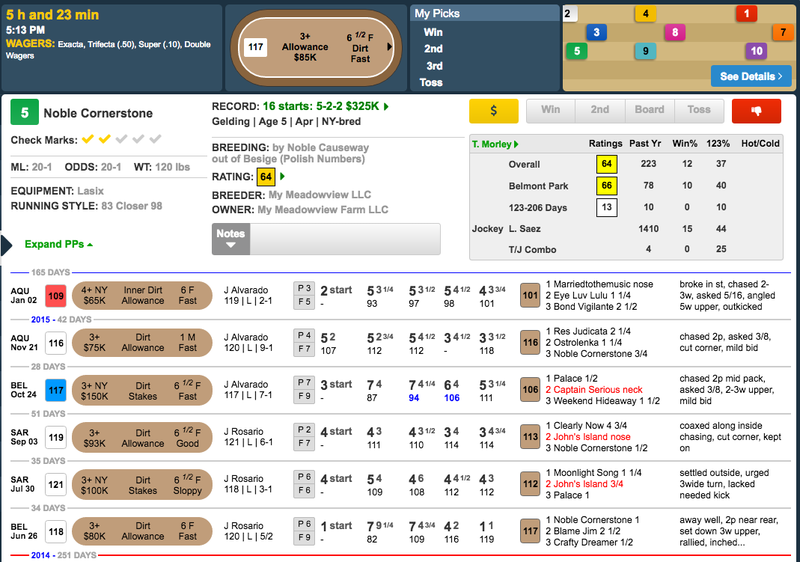 Belmont Wednesday Highlight Horse: Can Noble Cornerstone win off the layoff again? The Pace Projector is predicting that Juba (#7) will be racing on the lead in a situation favoring the frontrunner. While he did earn an impressive 118 speed figure for his blowout win last time, he was allowed to set a slow pace (color-coded in blue) against slightly weaker competition. Today, we have to think that Chief Lion (#1), who is posted to his inside, will be sent out towards the front as well, employing the same tactics that worked so well for him at Penn National. If he can soften up Juba just enough, there are a couple of interesting late runners that we believe can make an impact. Nubin Ridge (#3) always seems to show up with a strong late kick, and he’s stretching back out to one of his best distances. The layoff is somewhat of a concern, but this horse always seems to be a fair price. Loki’s Vengeance (#8) ran well against the in-form Weekend Hideaway last time and has run plenty of races that would make him competitive in this spot. Our top selection is NOBLE CORNERSTONE (#5), whose form towards the latter part of 2015 looks worse than it actually was due to a combination of factors (wet tracks, wrong distances, slow paces). He ran extremely well in a similar scenario off the layoff last year, and he’s working as if he’s ready for another top performance here.